The Konkola section of the Zambian Copper Belt comprises a near continuous, NW-aligned, close to 20 km long by 2 to 4 km wide ribbon of ore within the Neoproterozoic Lower Roan Subgroup. It extends from the northern margin of the regional 'Kafue Anticline' basement block, and is down-folded, to emerge again on the rim of the Konkola basement dome to the northwest. 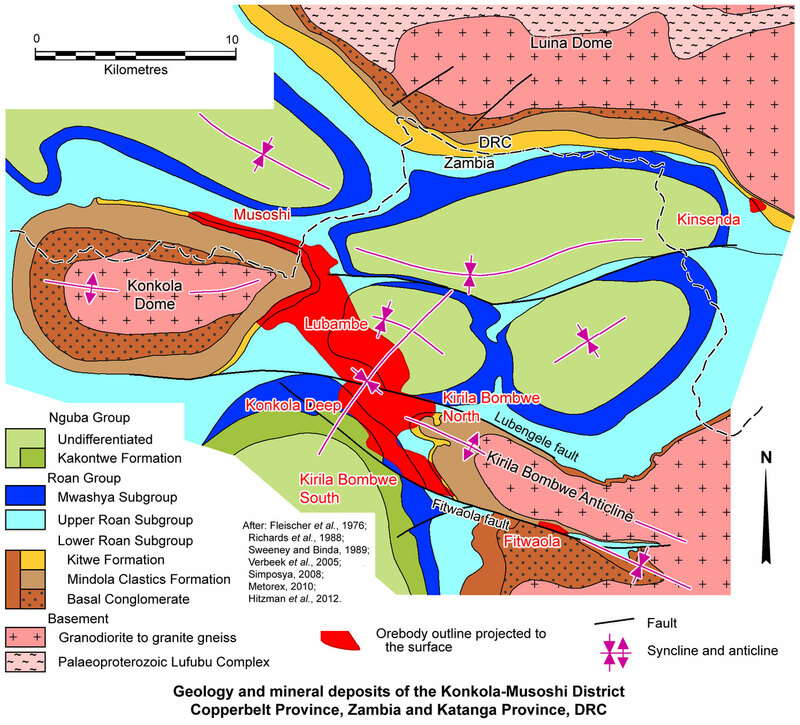 This mineralised ribbon includes, from SE to NW, the fault isolated Fitwaola, then Kirila Bombwe South and North (previously Bancroft, also collectively known as Konkola), Konkola Deeps, Lubambe (previously Konkola North) and Musoshi. All of these deposits are within Zambia, with the exception of Musoshi, which is the continuation into the Democratic Republic of the Congo (DRC). The Lubambe and Musoshi deposits are exposed on the southeastern, eastern and northeastern rim of the Konkola Dome. The Kirila Bombwe and down dip extension, Konkola Deeps deposits occur to the SE, on the western margin of the Kirila Bombwe anticline, and are located ~20 km kilometres to the NW of the Nchanga group of mines. Fitwaola represents an overthrust synclinal enclave within basement and footwall rocks, 6 km to the SE of Kirila Bombwe South (#Location: Lubambe - 12° 17' 56"S, 27° 46' 05"E; Kirila Bombwe South - 12° 22' 45"S, 27° 49' 45"E). For details of the regional setting of Konkola section, the Central African/Zambian Copper Belt and the Lufilian Arc, see the separate Zambian Copperbelt record. The northwestern tip of the regional, >200 long, by 20 to 50 km wide 'Kafue Anticline' basement block is locally represented by the WNW trending, 'semi-domal', Kirila Bombwe Anticline. Where the Lower Roan Subgroup laps onto and overlies basement along the western margin of the latter structure, it hosts the Kirila Bombwe and Fitwaola ore deposits. The Konkola Dome is an east-west elongated, 10 x 5 km core, largely composed of Palaeoproterozoic granioids, some 15 km to the NW of the exposed 'Kafue Anticline'. It represents the northwestern re-emergence of basement in the crest of the NW-SE oriented, Kirila Bombwe Anticline, down-folded by the NE-SW oriented Kowambe cross syncline between the two basement blocks to produce a saddle shaped structure. The concealed, near continuous, NW-SE trending ribbon of ore connecing the exposed Lubambe-Musoshi and Kirila Bombwe deposits follows the down-folded crest of the Kirila Bombwe Anticline, connecting the Konkola Dome and Kafue Anticline respectively. The sequence varies over the 20 km length of the Konkola mineralised complex, from Kirila Bombwe in Zambia to the SE, to Musoshi in the DRC to the NW. The Lower Roan Subgroup sequence at the Kirila Bombwe and Lubambe-Musoshi areas are detailed and discussed separately below, followed by a summary of the overlying sequence. Footwall Conglomerate, which is 0 to 3.5 m thick (increasing in thickness to the north and absent to the south) and is composed of a highly porous arkose with partially rounded red feldspar clasts and rare white quartz pebbles. This unit is the transgressive base of the Ore Formation. Locally, mineralisation, mainly supergene, extends down into this unit and as much as 3 m into the underlying Sandstone Unit, possibly reflecting the presence of original primary sulphides. • Unit F - the remainder of the Banded Shale and Sandstone Formation, composed of a commonly kaolinised feldspathic sandstone with no crossbedding or detrital iron. • Hangingwall Aquifer, 15 to 75 m thick - composed of interbedded siltstone, dolomitic sandstone and dolostone. • Shale with Grit, 40 to 160 m thick - composed of feldspathic and dolomitic sandstones, interbedded with coarse grained calcareous sandstones to grit, forming a transition to the overlying Upper Roan Group, with increasing dolomitic interbeds upwards. • Chimfunshi Member, a thick, fining upwards sequence of polymictic boulder conglomerate and arkose, deposited in a proximal alluvial fan setting, indicating proximity to rapidly uplifted basin margin faults. This unit is absent in the footwall of the ore deposits on the eastern flank of the dome, but appears at the base of the sequence immediately to the west of Lubambe and SW of Mushoshi, respectively overlying both the southern and northern margins of the Konkola Dome basement, and rapidly thickening westward. • Kafufya Member, 50 to 100 m thick, which unconformably overlies basement in the footwall of the deposit, and is represented by a sequence of immature hematite-rich arkosic sandstones and conglomerates with subordinate argillaceous rocks, characterised by large-scale cross bedding with heavy mineral lags, variously interpretted as dune sands (Richards et al., 1988), or braided stream mid-fan deposits (Simposya, 2008). Most of this unit contains 10 to 15% feldspar, predominantly secondary plagioclase. Evidence of leaching and removal of specular hematite and iron oxide coatings of detrital grains is widespread, resulting in a bleached appearance. Dissolution casts after possible evaporites are evident. At the Lubambe deposit, the bulk of the drilling has only penetrated to 30 m below the top of the Kafufya Member, encountering rocks that are typically a grey, porous, massive arkose that contains abundant dissolution cavities, considered to be after evaporates. On the eastern margin of the Konkola Dome, the Kafufya member, which marks the top of the Mindola Clastics Formation, is capped by a 10 to 15 m thick conglomerate that pinches out on the southern limb. This conglomerate, which is clast supported with pebbles of predominantly K feldspar and arkose that average 12 mm in diameter, marks the unconformable contact with the overlying Kitwe Formation. • Mutonda Member, which is ~400 m thick, and commences with a coarse, cross-bedded arkose, overlain by a suite of interbedded arkose and argillaceous sandstone, and a coarse-grained arkosic conglomerate and crossbedded sandstone. These are followed by a sequence of argillaceous arkosic sandstone, and an upper footwall conglomerate and coarse arkose that marks the top of the Mindola Clastics formation and the immediate footwall to the orebody. - OS1 Member, 3 to 12 m thick, correlated with the Copperbelt Orebody Member regionally, and the Lower Banded Shale at Nchnga. This member abruptly overlies the conglomerate/arkose of the Kafufya Member, and is the principal host to mineralisation. It is a fine-grained (average grain size of 65% <75 µm), partially dolomitised siltstone, with thin white dolomite interbeds and occasional thin sandy lenses that are preferentially oxidised and leached. The siltstone is composed of 40% microcline, 30% K feldspar, 30% quartz, 2% dolomite and subordinate rutile, tourmaline, zircon and white mica. - OS2 Member, 5 to 30 m thick, which gradationally overlies the OS1 Member, and comprises a sequence of interbedded siltstone and fine-grained arkose. The grain size and proportion of arkose increases upwards, with the base of the member defined at the first obvious fine-grained arkose bed. Interbedding is on a centimetre to decimetre scale, with load, flame and dewatering structures commonly observed, together with ripple cross lamination and starved ripples. - OS3 Member, which varies from 3 to 213 m in thickness, and comprises a medium- to coarse-grained arkose, gritty in parts. The basal contact is gradational, defined by the last siltstone interbed. It is extensively, partially to pervasively replaced by K feldspar with remnant dark grey argillaceous material. - OS4 Member, comprising an 83 to 310 m thickness of interbedded arkose and subordinate siltstone. - OS5 Member, 0 to 47 m thick, a siltstone-shale-dolomite unit similar in appearance to OS1. Like OS1, it is frequently mineralised by fine-grained chalcopyrite, although not of sufficeint grade to be economic. The upper and lower contacts are characterised by soft sediment deformation. Scapolite and nodular dolomite pseudomorphs are locally evident, posibly after anhydrite/sulphate evaporites. - OS6 Member, occurring locally, where OS5 grades into an interbedded siltstone and arkose suite. - Konkola Member, 5 to 20 m thick, a pink to red clast-supported conglomerate, that has an erosional lower contact, and is dominantly composed of K feldspar pebbles averaging 7 to 8 mm in diameter, to a maximum of 40 mm, set in a gritty matrix. Heavy mineral cross bedding is common. - Shale with Grit, 60 to 290 m thick, which has a gradational lower contact with the Konkola Member, and comprises a sequence of thinly interbedded arkose, siltstone and grit cycles. The package occurs as thin, fining-upward cycles of grit, ripple cross laminated arkose and siltstone, with individual cycles varying from 5 cm thick at the base of the member, increasing in thickness upwards to about 50 cm at the top. These cycles are interpreted to represent thin, but areally extensive sheet outwash flows in a playa lake setting. Dewatering structures are common as are grit infilled mudcracks at the top of individual cycles. - Chingola Member, 112 to 603 m thick, representing an extensively dolomitised section of the "Shale and Grit" sequence. The dolomite replacement is characteristically hematite stained and pink to red in colour. These dolostones are abruptly overlain by a 20 m-thick hematite-rich arkose unit and a décollement. At Nchanga, the carbonate unit known as the "Chingola Member" underlies the "Shale and Grit", which is overlain by the dolostones and lesser argillites of the Upper Roan Subgroup (e.g., McGowan, 2003). • "Ore Shale", the equivalent of the Copperbelt Orebody Member, which is 15 to 20 m thick, is primarily a black, laminated, biotite-rich shale to siltstone, representing the first reduced unit above basement, separated from the latter by ~1 km of oxidised, principally arenites and conglomerates. The basal 1 to 2 m of this unit is entirely barren, the upper margin of which is marked by a 2 to 5 mm thick, sub-concordant, band of intense iron oxide disseminations that is immediately overlain by the Cu sulphides of the orebody. • "Musoshi Formation", ~300 m thick, commencing with a suite of arkose that has a transitional contact with the underlying "Ore Shale" grading from shale/siltstone, via micaceous siltstone/sandstone to coarse arkose. The arkose includes a number of siultstone and conglomeratic intervals, before passing upwards into a pyritic, sandy dolostone, and then into a unit of interbedded arkose and siltstone, another coarse arkose, interbedded arkose, feldspathic and laminated siltstone, and an upper gritty siltstone ("Shale and Grit"? ), before a sharp contact with the Kanwangungu dolostone equated with the Upper Roan Subgroup. Upper Roan Subgroup, 100 to 450 m thick - composed of interbedded dolostone, dolomitic sandstone and dolomitic shale, taken here to overlie the "Shale and Grit" Member. At Kirila Bombwe, gritty sandstones and crystalline dolostones have been encountered in drilling (Schwellnus, 1961). At Lubambe, Simposya (2008) equates the "Shale with Grit" Member and the gradationally overlying "Chingola Member" with the Upper Roan Subgroup. It is uncertain therefore if the latter belongs to the Lower or Upper Roan Subgroups. However, the "Chingola Member" of Simposya (2008) is truncated above by a décollement that separates it from a 50 to 575 m thick interval of brecciated, laminated dolomitic siltstone and arkose, intruded extensively by fluidised dolomitic breccias, which that author has included in the lower Mwashya Subgroup, but may represent part of the Upper Roan Subgroup. The fluidised breccias are generally stratabound, but are locally discordant. They are red to grey-green in colour, matrix supported, and lack internal deformation. The clasts are subangular to well rounded, and dominantly of siltstone and dolomite, within a matrix that is mainly dolomite, albite and chlorite. Extensive albitisation has almost completely replaced the original matrix mineralogy. These tectonic breccias were sourced from, and controlled by, the existence of evaporitic horizons and are thought to be related to the Roan megabreccias of the DRC seqeunce. 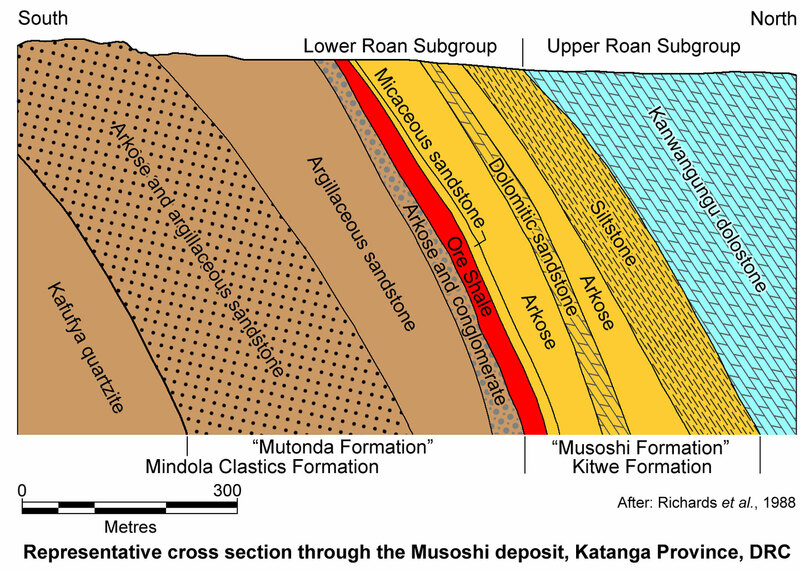 At Musoshi, the Kitwe Formation is overlain by the 100 to 700 m thick Kanwangungu Dolostone, which has been correlated with the Upper Roan Subgroup (Richards et al., 1988; Cailteux 2007; Torremans et al., 2013), and comprises interbedded dolostones and dolomitic siltstones. • Well laminated greenish-grey dolomitic siltstone, evaporitic in parts, varying from 355 to 780 m in thickness. Variable amounts of dolomite occurs throughout, and locally, massive white dolomite replacement obliterates sedimentary structures. Subhedral pyrrhotite and minor pyrite also overgrow the sedimentary structures. • Pyritic carbonaceous dolomitic shale, 15 to 30 m thick, with minor calcite secretion veins. • Laminated dolomitic siltstone, with disseminated fine-grained biotite overgrowing the sedimentary lamination, and 20 to 30% anhydrite developed along bedding, possibly after evaporites. • Strongly folded and sheared, interbedded dolostone and dolomitic siltstone, ~200 m thick, with common talc-infilled bedding parallel shears, and abundant disseminated and vein-hosted anhydrite. A 40 m thick microbrecciated dolomitic siltstone, overlain by a wavy banded, 30 m thick algal dolomite unit is developed towards the top of the unit. • A 120 m thick, pink, grading upwards to white to grey, fine-grained dolostone unit, with dissolution cavities and stylolites throughout. Nguba Group that overlies the Mwashya Subgroup in a series of syncline to the NE and SW of Kirila Bombwe. This suite comprises a thinned diamictite at the base, the Grand Conglomérat, followed by a suite of limestone and dolostone of the Kakontwe Formation are locally ~250 m thick. These are overlain by a thick sequence of shales with minor dolostone. 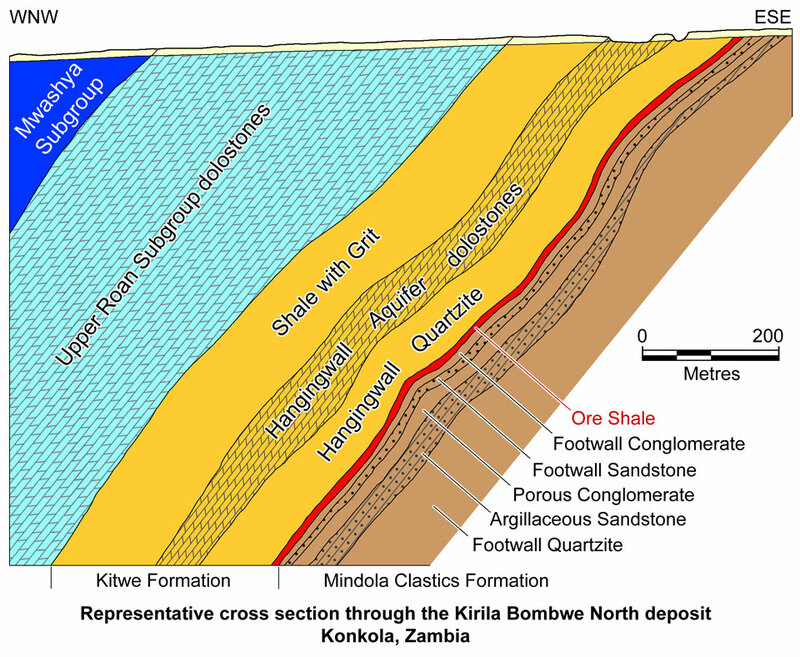 Unlike many of the deposits fringing the Kafue Anticline, which are associated with thin developments of the Lower Roan Group, and are influenced by basement topography, the Konkola section deposits from Kirila Bombwe to Musoshi are underlain by a greater thickness of Footwall Formation meta-arenites and conglomerates. The Fitwaola deposit, the southern most of the complex, is 3 to 8 m thick and dips at an average of 65°N, on the northern flank and nose of a syncline, the southern limb of which has been disrupted and removed by the WNW-ESE Fitwaola Fault. The structure in the Kirila Bombwe mine area comprises an en echelon anticlinal development, with five bench-like parasitic folds on its southwestern limb, plunging at low angles, generally trending at 295 to 310° and plunging 5 to 15°NW, with a subvertical axial plane. The western limbs are steep to near vertical, while the middle limbs have a moderate northerly dip, and only on the major folds is there an easterly dipping component. Overall, Kirila Bombwe South averages 7 m in thickness, dips at 50 to 70°W and has been traced to a depth in excess of 2000 m at Konkola Deeps, below the barren gap between the two Kirila Bombwe orebodies, where they are continuous. Kirila Bombwe North and the down-dip portion of Konkola Deeps, average 5 m in thickness, and lie across the nose of the main anticline, with more gentle dips to the north and NW. Considerable slippage is evident in argillaceous beds, with shearing along bedding planes, and in some steep footwall formations, sericite schist is developed with lenticular quartz-feldspar veining (Freeman, 1988; Fleischer et al., 1976). Further NW, the northeastern boundary of the Kirila Bombwe and Konkola Deeps orebodies coincide with an abrupt thinning of the Mindola Clastics Formation rocks and eastward pinchout of the Copperbelt Orebody Member, interpreted to have been caused by the NW to WNW-trending synsedimentary Lubengele growth fault. The southern boundary of the Kirila Bombwe South orebody is similarly marked by the Fitwaola (or Luansobe) fault, which dips at 82°N. Northwestward, the orebody follows the NW-plunging Kirila Bombwe Anticine to depth (Hitzman et al., 2012). The Lubengele dextral fault, which is parallel to the WNW-ESE Fitwaola Fault, dips at 79°S, has a throw of ~300 m (Sweeney and Binda, 1989), and offsets the Kirila Bombwe Anticine and Konkola Dome at depth. It also controls the southeastern margin of the Lubambe deposit. At the other extremity, the northwestern sections of the Lubambe deposit and its western extension, Musoshi, occur along the flanks of the eastern Konkola Dome (Hitzman et al., 2012). Lubambe is a continuous tabular orebody that comprises the two distinct South and East Limbs, flanking the eastern and southeastern flanks of the Konkola Dome respectively, and the down-dip SE-trending extensions, Block A and Block A Extension. The mineralisation within these four areas, is continuous between the Konkola Dome and the mineralisation at Konkola Deeps to the SE on the Kirila Bombwe Anticline (Simposya, 2008). On the flanks of the Konkola Dome, the orebody generally strikes in a NE to SW direction and dips at between 15 and 77°S, with a true thickness varying between 3 to 15 m in the currently (2011) planned mining areas and up to 18.6 m in the high grade, deeper sections (Block A and Block A Extension). There is a narrow barren to low grade pyritic gap separatingthe East and South limbs of the Lubambe deposit where it wraps around the eastern nose of the Konkola Dome (Freeman, 1988). The East Limb orebody has an average dip and true thickness of ~45°E and 5.3 m rerspectively, while the same for the South Limb is 60°SSE and 4.7 m. Over the extent of Block A and Block A Extension, the orebody occurs at between 760 and 1600 m below surface with a variable dip of between 0 and 40°. The thickness of the orebody increases towards the south, where it averages 9 m true thickness and transgresses the sequence from the OS2 to the Kafufya Members (Simposya, 2008). The East limb at Lubambe is continuous to the west as the Musoshi deposit, developed along the eastern half of the northern rim of the Konkola Dome, dipping north at ~70° and is ore over a thickness of up to 10 m. The western limit of mineralisation at Musoshi is found to the NW of the eastern pinchout of the Chimfunshi Member basal conglomerates on the northern flank of the Konkola Dome. Similarly, the southwestern limit of economic mineralisation in the Copperbelt Orebody Member on the South Limb at Lubambe, approximately coincides with the eastern pinchout of basal conglomerate. These depositional changes are thought to reflect a synsedimentary growth fault (Hitzman et al., 2012). Two fold trends are recognised in the Lubambe area, namely i). earlier 20° trending folds that plunge to the south with axial planes dipping 60°SE,characterised by zones of brecciation; ii). a later dominant fold set trending at 290°, parallel to the main regional structural grain of the Lufilian Arc, with fold axes plunging to the NW and axial planes dipping 60 to 80°NE. Fold intersections are commonly sites of oxidation, leaching and brecciation of ore (Simposya, 2008). The Lower Roan Subgroup rocks in the Konkola district are considered autochthonous, although the overlying Mwashya Subgroup and Nguba Group are thrust over the underlying sequence along a prominent décollement within the middle to upper Upper Roan Subgroup carbonate rocks, and as such are largely allochthonous (Simposya, 2008). Copper mineralisation is largely hosted within the Copperbelt Orebody Member at the Kirila Bombwe deposits, and the equivalent OS1 Member at Lubambe, the first major reduced horizon above the thick (~1 km) sequence of oxidised arkoses and conglomerates of the Mindola Clastics Formation. At Lubambe, although copper mineralisation occurs mostly within the OS1 Member, it is crosscutting on a gross scale, and pinches out towards the east within the overlying OS2 Member. Also, although sulphides occur throughout the Copperbelt Orebody Member in the southern Konkola district, they are mainly concentrated in dolomitic siltstone intervals, with minor amounts also occurring within conglomerates of the uppermost Mindola Clastics Formation (Sweeney et al., 1986). The overall paragenetic sequence of the major primary ore sulphides is carrollite → chalcopyrite → bornite → chalcocite (Sweeney et al., 1986). There is a lateral zonation in sulphides within the Copperbelt Orebody Member and constituent beds, best preserved in the less permeable Unit B at Kirila Bombwe. Pyrite dominates to the west, distal to ore, passing progressively eastward into chalcopyrite, to bornite and to chalcocite (Garlick in Fleischer et al., 1976). Similarly at Lubambe and Musoshi, the bornite zone is to the east, passing westward into chalcopyrite and then to pyritic, carbonaceous shale. The latter transition is exposed on the southeastern and northern margins of the Konkola Dome, such that ore only occurs on the southeastern, eastern and northeastern rim of the dome. Malachite and supergene chalcocite truncate the uplifted and weathered bornite and chalcopyrite zones on both the northeastern and southeastern rims of the dome (Garlick in Fleischer et al., 1976). The lowermost 1.5 m of the OS1 Member at Lubambe and Musoshi (and Unit A at Kirila Bombwe) is massive and contains very little copper. The transition to >1% Cu is abrupt, and takes place over centimetres, immediately above a thin (2 to 5 mm), sub-concordant red iron oxide-rich layer, marking a 'redox' boundary. The upper contact of the >1% Cu zone, an "assay hanging wall", is also well defined, but not as sharp as the footwall contact (Simposya, 2008). At Musoshi, the grade above the "redox" boundary red line, may reach 5% Cu over the first metre or more, remain >3% Cu for a further 3 to 4 m, and average >1% Cu over thicknesses of up to 10 m, although sulphides do not persist into the hanging wall arkoses. Bornite occurs within the highest grade sections, although the bulk of the primary sulphides are chalcopyrite. Pyrite becomes dominant in the upper part of the "Ore Shale". Carrolite is rare. Within the "Ore Shale", sulphides are concentrated in the coarser grained laminae of the siltstone, indicating a permeability control on the detailed distribution of mineralisation (Richards et al., 1988). i). disseminated sulphides, either randomly distributed within the host rock, or concentrated along bedding planes or dolomitic bands, dominantly chalcopyrite, bornite and chalcocite. The ore minerals are very variable in relative abundance, irregularly shaped, and often mutually intergrown, with grain sizes that mimic those of the host rocks. Minor carrollite and accessory sub- to euhedral pyrite are also present. ii). clusters in cemented lenses that are partially cross-cutting, and are interstitial to, and corrode, authigenic quartz, microcline and dolomite. Sulphides in coarse grained lenses may be as much as 500 µm in diameter, while in smaller, or more irregular lenses, authigenic quartz and feldspar can sometimes be seen to completely engulf some of the finer grained chalcopyrite. This indicates that sulphides were emplaced both before and after precipitation of authigenic quartz, feldspar and dolomite. Chalcopyrite, chalcocite and bornite, which are often intergrown, are the principal ore minerals. Late digenite, covellite, chalcocite and goethite replace chalcopyrite and bornite along crystal edges or along cracks in those minerals. Bornite can be altered to chalcopyrite at mineral edges, although the converse is infrequent. Rare euhedral pyrite cubes are almost invariably surrounded by bornite rims in a chalcopyrite matrix. iii). layer-parallel or irregular veins, that follow bedding for several metres, and are mostly <2 cm thick. The principal gangue mineral is dolomite, with lesser quartz and microcline, minor biotite and accessory muscovite and chlorite. Crystals grow inward from vein margins, including sub- to euhedral quartz and smaller, blocky crystals of microcline and plagioclase. The sulphide minerals, which are late in the paragenesis of the veins, are chalcopyrite, bornite and chalcocite with minor subhedral pyrite, and typically, but not always, postdate the coarse dolomite. Torremans et al. 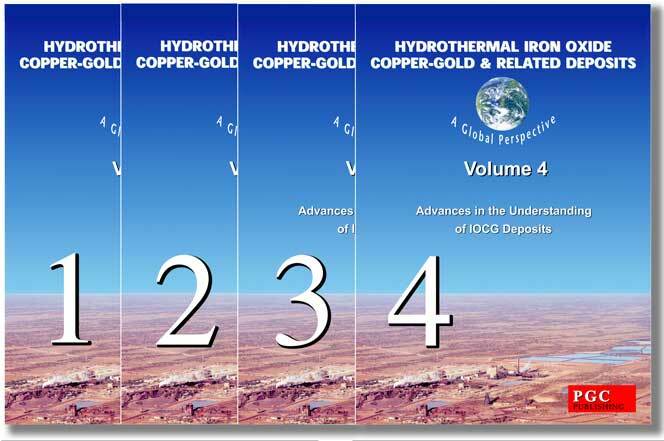 (2013) report that δ34S isotope values range from -8.7 to +1.4‰ V-CDT for chalcopyrite from all mineralising phases and from -4.4 to +2.0‰ V-CDT for secondary chalcocite. These similarities in δ34S for sulphides from different vein generations, 'sulphide cements' and secondary chalcocite, suggest mobilisation of S from earlier formed sulphide phases, or derivation of S from the same pre-sulphide authigenic sulphates (anhydrite) within the host sequence. Deep supergene sulphide enrichment and leaching occurs to depths of as much as 1 km below the surface, predominantly in the form of secondary chalcocite, goethite and malachite and is often associated with zones of high permeability. This leaching and enrichment does not result in the addition of S, and will retain the same isotope ratios as the primary sulphide. Simposya (2008) note that the primary mineralisation at Lubambe, occurs as: i). finely disseminated sulphides mimicking the grain size of the host rock, ii). as coarser grains along bedding planes and cleavage, iii). in thin veinlets, and iv). in lenticles and stringers. These minerals comprise chalcocite, chalcopyrite, bornite, digenite, covellite, pyrite and carrollite in approximate order of abundance. On the South Limb, the primary mineralisation, mainly disseminated, comprises fine-grained chalcopyrite, with a grain size of ~70% <75 µm, with 5 to 10% of the grains <20 µm. On the east limb, the mineralisation is slightly coarser grained, with 62% of the sulphide grains passing 75 µm. The primary sulphide assemblage at Kirila Bombwe, Lubambe and Musoshi has been almost completely overprinted by supergene modification to depths sometimes in excess of 600 m below surface. A large proportion of the non-sulphide supergene copper minerals occur along fractures and veins replacing the primary assemblage (Simposya, 2008). In the Kirila Bombwe South deposit, chalcocite, part of which is primary, predominates below the 580 m level, although above the 420 m level, malachite is dominant (Simposya, 2008). On the flanks of the Konkola Dome, the typical mixed ore mineralogy below 300 m is 65% chalcopyrite, 17% chalcocite, 15% malachite, 1% each of bornite, digenite and covellite. At between 200 and 300 m on the East and South limbs, the ore assemblage is ~63% chalcocite, ~27% malachite, ~4% of both bornite and chalcopyrite, and ~1% each of digenite and covellite. Above 200 m, chalcocite and non-sulphide copper minerals predominate, which are, in order of abundance, malachite, pseudomalachite, chrysocolla, cuprite, azurite and native copper. Shallower than 30 m, the orebody is usually completely leached (Simposya, 2008). This vertical zonation of supergene copper minerals reflects an increase in copper content and a decrease in iron and sulphur with depth. 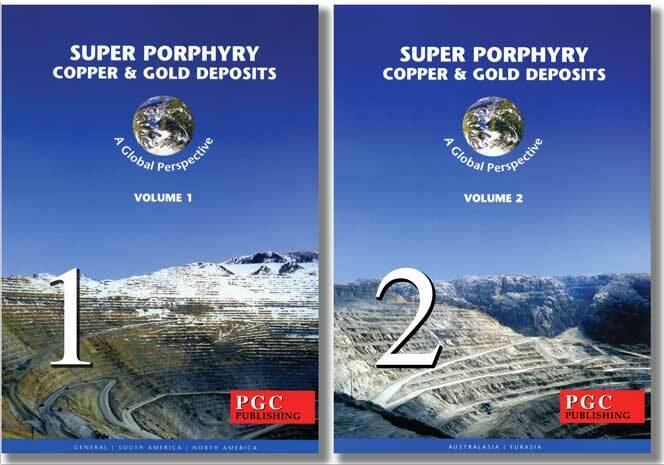 Oxidation and leaching of copper at higher levels, and downward transport of copper is accompanied by chalcocite replacement of primary chalcopyrite and bornite near the base of the supergene profile, diminishing upwards, largely controlled by structure and permeability. Leaching and oxidation is frequently concentrated at the base of the OS1 Member, where the contact with the underlying conglomerate/arkose presents a permeability channel. Iron oxide after oxidation of chalcopyrite and bornite is common in leached zones, comprising mixtures of hematite, iron oxide-hydroxides and iron oxide-hydroxide-hydrates. Hematite occurs as ordered intergrowths of hematite lamellae and is mostly related to the late K feldspar-hematite-quartz alteration event. Limonitic aggregates are concentrically zoned, containing traces of secondary copper minerals and weathered copper sulphides. The copper-phosphate pseudomalachite normally occurs as spheroidal aggregates, often surrounded by concentrically zoned shells of limonite. Dolomitic siltstones within the Copperbelt Orebody Member at Kirila Bombwe have high K:(Al-Na) ratios (Moine et al., 1986), due to the presence of abundant secondary microcystalline K feldspar. The host siltstones contain significant amounts of authigenic quartz, microcline/K feldspar and albite, which occur as overgrowths on detrital grains or as a cement in the host rock. Detrital quartz and feldspar grains are corroded by the authigenic overgrowths (Torremans et al., 2013), with detrital plagioclase partially to completely replaced by K feldspar (Selley et al., 2005). Authigenic dolomite, mostly Fe-rich, occurs in multiple pulses, both prior to, and after, authigenic quartz and feldspar overgrowths. Dolomite is found in bands as a pervasive matrix cement, regularly occurring in Units C and D of the Copperbelt Orebody Member. The transition between these bands and the enclosing host rocks are both gradual and abrupt. Sweeney and Binda (1989) note that dolomite lenticles contain traces of calcium sulphate and are interpreted to be anhydrite pseudomorphs. Microcline often overgrows and engulfs authigenic quartz and early dolomite. Late phase carbonate fills pores and cracks and can, locally, completely replace the matrix. The host rocks also contain less abundant, later fracture-controlled secondary K feldspar. Sulphides are commonly intergrown with secondary feldspar, suggesting simultaneous precipitation. Biotite and muscovite are also important constituents of the Ore Shale. These phyllosilicate overgrowths are interpreted to have formed during metamorphism and show important crosscutting relationships with both sulphides and the other authigenic minerals (Torremans et al., 2013). A number of barren gaps are found laterally along the length of the mineralised "Ore Formation" in the Konkola mineralised complex, e.g., the 1.5 km gap between the Kirila Bombwe North and South deposits, which corresponds to an increase in the frequency and thickness of sandy dolostone and cherty quartz lenses, interpreted to reflect an algal bioherm developed on a local basement high, as found in similar barren gaps elsewhere on the Copper belt (Fleischer et al., 1976). This barren gap extends to a depth of 720 m below surface, beyond which the two orebodies are then connected (Katongo, 2005). Similarly, at Lubembe, the orebody is thinnest in the low grade to barren gap between the East and South Limbs. This gap correlates with a structural high interpreted from geophysical data (Simposya, 2008). The lateral margins across the mineralised Copperbelt Orebody Member are controlled by facies distribution, e.g., the eastern margin of the Kirila Bombwe North deposit, where, as the assay margin is approached, the hanging wall and footwall assay boundaries converge, the calcareous sandy laminae become thicker and more sandy and after all ore has been terminated, the ore shale grades into a calcareous sandstone which cannot be differentiated from the footwall beds, and the latter, in turn, thins and pinches out against the Kirila Bombwe Anticline basement. A similar facies transition controls the western margin of the Lubambe South Limb, where the Copperbelt Orebody Member thins and lenses out. 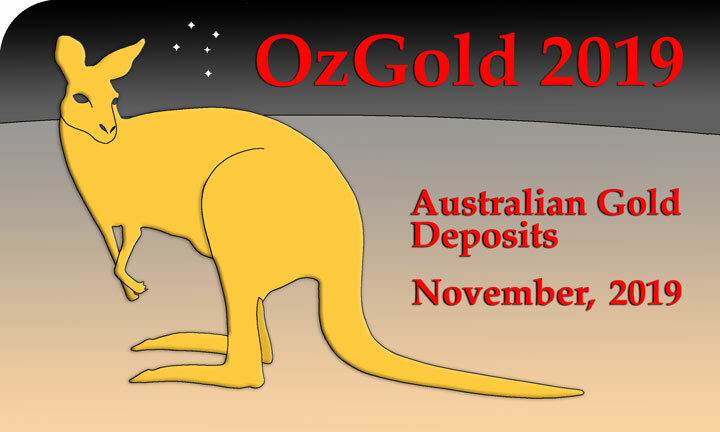 remaining inferred resource in 2007 - 24 Mt at 2.4% Cu (Metorex Limited, JSE Release, 2007). Production at Konkola commenced in 1957 as the Bancroft (later Chililabombwe) mine which exploited the Kirila Bombwe North and South deposits. Mining was commenced subsequently on the Konkola dome. The Konkola mine (and Konkola Deeps development) in 2011 was operated by the Vedanta subsidiary Konkola Copper Mines (KCM), as part of a combined operation that also mines the Nchanga deposit. The Lubambe (Konkola North) orebody was developed between 1953 and 1959 and exploited for a period of ~2 years before closing due to the poor economic conditions, and has only recently been re-evaluated and developed for production by a joint venture between African Rainbow Minerals (ARM; 40%), Vale (40%) and ZCCM (20%). LeFebvre, J.J. and Tshauka, T., 1986 - Alterations associees a la minerausation uranifere de musoshi (Shaba, Zaire) [Alteration associated with the uraniferous mineralisation of Musoshi (Shaba, Zaire)]: in Koninklijk Museum Voor Midden-Afrika - Tervuren, Belgie Annalen - Reek [Annals of the Royal Museum for Central Africa - Tervuren, Belgium], Geologische Wetenschappen v.8, No. 92, pp. 1-63.